This 3 days gorilla tour has 2 options. 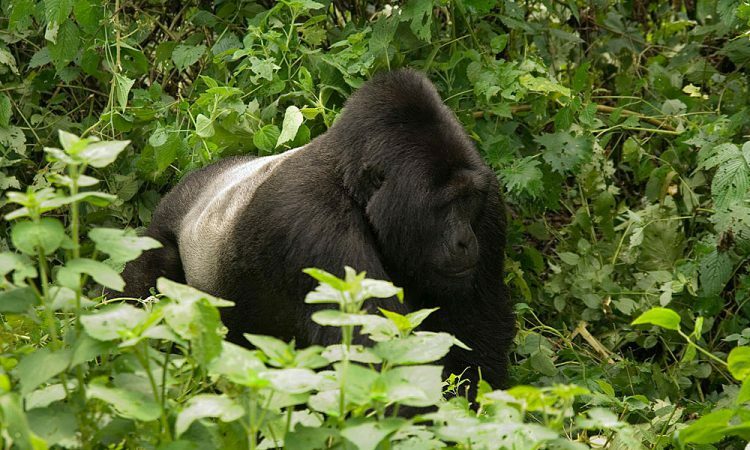 The first is 3 days bwindi gorilla trek from Entebbe – Kampala and second is 3 days Uganda gorilla trekking from Kigali. This tour takes you to Bwindi Impenetrable National Park, apparently the best place to see mountain gorillas in Africa for a challenging but very rewarding gorilla trekking experience. You will get to see the mountain gorillas in their natural habitat. This is a once in a lifetime adventure in Uganda. The price of a gorilla permit in Uganda is still at $600 through out the year. Permits cost $1,500 in Rwanda. Both permits allow you to spend only up to maximum of one hour in their natural habitat. This first option (3 days bwindi gorilla trek from Entebbe) lets you arrive from Entebbe / Kampala, transfer to Bwindi Impenetrable National Park (an 8 hours drive) for your gorilla trekking encounter and return to Kampala for your departure. Please see the detailed tour itinerary below. In the morning of this first day of your 3 days bwindi gorilla trek from Entebbe, your guide will drive you from Kampala to Bwindi Impenetrable National park, with stopover in Mbarara town for lunch. Upon arrival you will check-in to your hotel or lodge. In the morning of this second day of your 3 days bwindi gorilla trek from Entebbe, you will go to the park headquarters for routine briefing by the park rangers about the rules of gorilla trekking and how to conduct yourself when around the gorillas. You will then proceed into Bwindi forest for your gorilla trekking adventure which will last between 2-6 hours depending on the movement of the Gorillas. Meet and stay with the Gorillas for a maximum of one hour, then go back to the park headquarters and then to your Lodge for lunch and relaxation. You will spend the evening in a community walk in the nearby Batwa community of dwarfs, where you will be entertained and given tales of their unique culture of gathering and hunting. Dinner and overnight at your accommodation. In the morning after your breakfast on this last day of your 3 days bwindi gorilla trek from Entebbe, you will leave for Kampala with stopovers for photography and lunch reaching late in the afternoon, and you will be transferred to your hotel for dinner and overnight or to the airport for your scheduled flight. The second option (3 days Uganda gorilla trekking from Kigali) lets you arrive in Kigali, transfer to Bwindi Impenetrable National Park (a 4 hours drive) for mountain gorilla trekking and transfer back to Kigali in Rwanda for departure. Please see detailed program for this tour below. Depending on your actual location on this first day of your 3 days Uganda gorilla trekking from Kigali safari, which could be the airport or any hotel within Kigali, a driver guide from our Rwanda tours and travel company will pick you up and transfer you to a hotel of your preferred budget nearer to the park. During the drive from Kigali to Bwindi Impenetrable National Park, you have a chance of carrying our a city tour by visiting places like the Gisozi Genocide Memorial Genocide to get some history on Rwanda’s culture and history until you finally arrive at the hotel. You will then enjoy the atmosphere close to the home of the endangered species. You will be provided dinner by the hotel. Early morning after your breakfast at the hotel and lunch is packed; you will be met by our driver guide again who will take you to the park headquarters for the brief before you start off the trek. This brief is done at 7am at the headquarters. The bwindi gorilla trek can take from 2 hours to almost half a day until the gorillas are finally met. When you finally encounter the gorillas, you are allowed one hour to admire these creatures but at a distance of 6 meters. After finishing the trek, you will then have lunch and transferred back to your hotel as the night before. In the evening you may do an optional village excursion, visiting the community to wind up the second day of this 3 days Uganda gorilla trekking from Kigali safari. After taking breakfast at your hotel on this third day of your 3 days Uganda gorilla trekking from Kigali safari, you will check out and meet your driver who will transfer you back to Kigali. You will have a brief city tour of Kigali, visit the Genocide Memorial grounds, Kyamata cultural centre and some art and craft shops, if this wasn’t possible on the day of arrival. You will then have lunch and after dropped off at the airport or preferred location in Kigali by your guide. Other Alternations: Please note that it is also possible to arrive through Kigali, trek gorillas in Bwindi Impenetrable Forest and depart via Entebbe International Airport (3 days Uganda gorillas from Kigali with Entebbe departure) or arrive through Entebbe International Airport, trek Uganda gorillas in Bwindi and depart from Kigali in Rwanda (3 days Uganda gorillas from Entebbe with Kigali departure). We do have have all this variations of this at same and close pricing. All you have to do is clarify which option suits you better and we shall tailor your itinerary.